It’s getting to be that time of year again when everyone asks where to go to see the fall colors. Here at Tiffany’s Bed and Breakfast, we have a day-trip suggestion that will take you on two of Arkansas’ scenic byways, as well as another of our fabulous state parks! Start your morning off with Breakfast at Tiffany’s, then hit the road! Arkansas Scenic Byway 7, declared as one of Reader’s Digest “Most Scenic Drives in America”, will take you north through Hot Springs, past famous Bathhouse Row. Soon you will be passing through the Ouachita National Forest and Lake Nimrod. At Ola, turn onto Highway 10 and again pass alongside the Ouachita National Forest. 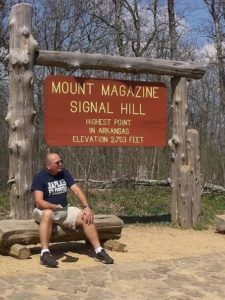 At Havana, turn onto Arkansas 309, which is the Mount Magazine Scenic Byway. This road will take you to the top of Mount Magazine, the highest point in Arkansas at 2,753 feet. As you ascend up the mountain, watch for waterfalls along the roadside. Stop at the visitors center to get park maps and souvenirs, then proceed on to the Lodge at Mount Magazine for a delicious lunch in the restaurant overlooking Petit Jean River Valley. 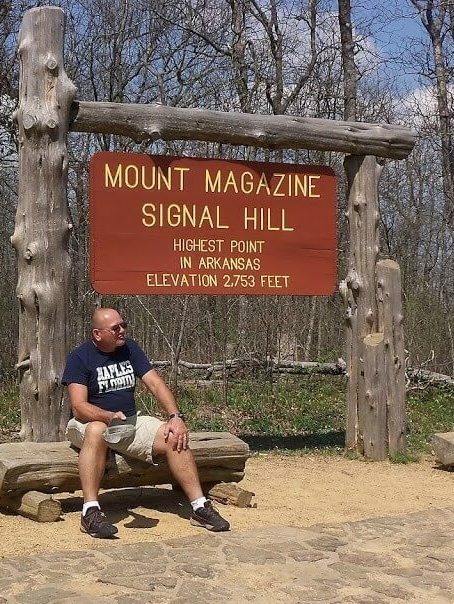 Once you’ve had your fill of food and breathtaking vistas, cross the road in front of the lodge and follow the 1.5 mile Signal Hill trail to the highest point in Arkansas. (I’m told this is also the highest point between Minnesota and Louisiana – and a quick web search indicates that might be true.) After returning to the lodge, drive around to Cameron Bluff Overlook Drive and stop for another breathtaking view of the opposite side of the mountain. Bring your binoculars and do some bird watching or just sight seeing from this fantastic vantage point. Once you’ve had your fill of Mount Magazine, head back down Highway 309 and on to Highway 10. This time when you get to Danville, take Highway 27 up and over the hill and continue on the west side of Lake Ouachita. Grab some dinner in Mt. Ida or Glenwood and then return back to Tiffany’s, where your oh-so comfy bed will be waiting for you! This entry was posted in area attractions, bird watching by admin. Bookmark the permalink.